If there are no driving forces for natural ventilation — no stack effect and no wind — then one might expect a 100 cfm ventilation fan to introduce 100 cfm of outdoor air into a house. In the real world, however, interactions between envelope holes and ventilation fans are almost always more complicated than the examples shown in this illustration. 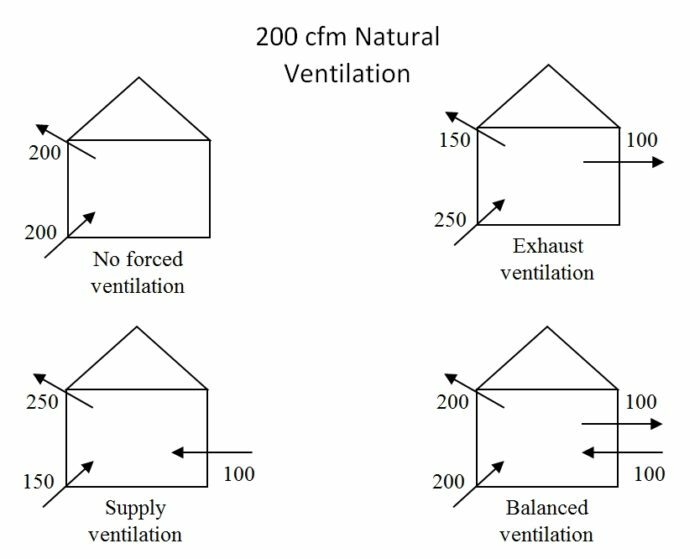 Image Credit: All images: Reid Baldwin This illustration shows scenarios that might occur in a house when a steady wind or the stack effect is causing 200 cfm of natural ventilation. Different types of 100 cfm ventilation systems interact with the holes in the building envelope in different ways. This graph indicates the relationship between the natural ventilation rate and the amount of incremental air that needs to be conditioned. (The line for exhaust is hidden under the line for supply because they are identical.) 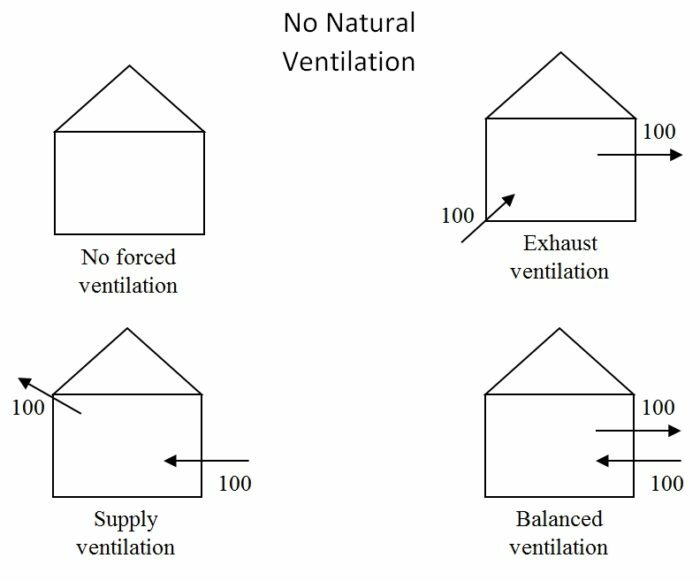 The illustration shows scenarios in a house with continuous ventilation as well as intermittent spot ventilation (when the natural ventilation rate is low). Supply ventilation and exhaust ventilation respond quite differently to the use of spot ventilation. 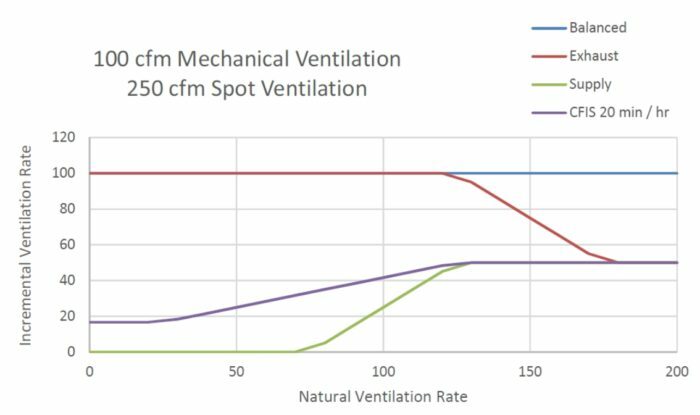 This graph shows the effect of each type of ventilation system when 250 cfm of spot exhaust ventilation is also operating. For exhaust ventilation, the passive reduction is delayed until much higher natural ventilation rates. For low natural ventilation rates, the supply ventilation system passively eliminates any additional ventilation, thus reducing the energy required to condition incoming air. Forced ventilation is about exchanging indoor air for outdoor air, which can be accomplished by pulling air in (supply ventilation), pushing air out (exhaust ventilation) or both (balanced ventilation). It is well known that these forced ventilation options impact which air gets exchanged, but each type should result in the same amount of additional air exchange, right? Not necessarily. It depends on what else is going on. When nature provides adequate ventilation, two of the options, supply and exhaust, passively reduce the amount of incremental air exchange, reducing incremental heating or cooling load. Due to interactions with spot ventilation, the amount of air that must be conditioned may be less in a tight house with supply ventilation than in the same house with exhaust or balanced ventilation. Before getting into an analysis of the various flavors of forced ventilation, let’s review why we need ventilation and why natural ventilation is sometimes inadequate. We condition the air in our houses — that is, we modify its temperature and humidity level — in order to make it suitable for our use. However, we also do things in our houses that pollute the air, making it unsuitable for our use. To remedy this problem, we exchange some of the conditioned, polluted indoor air for unconditioned, unpolluted outdoor air which we then condition. This exchange of indoor and outdoor air is called ventilation. 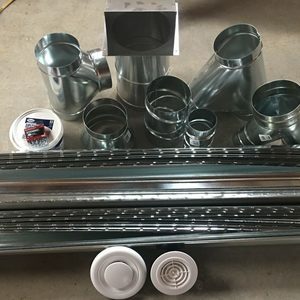 Two things are required in order to get air exchange: 1) holes in the house, and 2) some force that pushes indoor air out of some of the holes and pushes outdoor air into other holes. Nature provides a couple of forces to push air through the holes. First, when the indoor temperature is different from the outdoor temperature, a phenomenon called the stack effect causes a positive pressure differential on one side of a neutral pressure plane and a negative pressure differential on the other side of the neutral pressure plane. Second, wind blowing across the house creates areas of low pressure around some parts of the house and areas of high pressure around other parts. Air flows in from the areas of high pressure and flows out to the areas of low pressure. The amount of air exchange at any moment in time depends on the size of the holes and on the magnitude of the force. The magnitude of these natural forces, and therefore the amount of natural ventilation, varies considerably from day to day or even hour to hour. For a house with large holes, the natural ventilation rate is very rarely insufficient and is very frequently excessive. Therefore, Green Building Advisor is filled with articles about how to make the holes smaller. When we make the holes small, there may be a substantial amount of time during which natural ventilation does not provide sufficient air exchange. To remedy this, we add forced ventilation systems to create additional forces (although they may also add some small additional holes). Exhaust ventilation creates additional air exchange by using a fan to blow air out of the house. The fan lowers the average indoor air pressure, increasing the force tending to push air into the house. The total inward flow remains equal to the total outward flow. The pollution level is not the same everywhere within our houses. Some rooms, such as rooms in which we store chemicals, tend to be more polluted than other rooms. Exhaust ventilation has the advantage that we can control the locations from which air is removed. 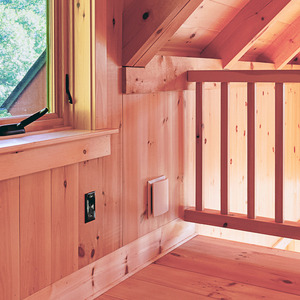 Supply ventilation creates additional air exchange by using a fan to draw air into the house. The fan increases the average indoor air pressure, increasing the forces that tend to push air out of the house. As with exhaust ventilation, the total inward flow remains equal to the total outward flow. 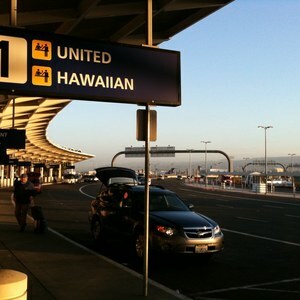 The outside air surrounding our houses is not equally clean. For example, garages are known for having pollutants. Supply ventilation has the advantage that we can control the location on the surface of the house from which the air is drawn. Balanced ventilation uses two fans: one drawing air in and another pushing an equal volume of air out. The average air pressure of the house is unaffected. 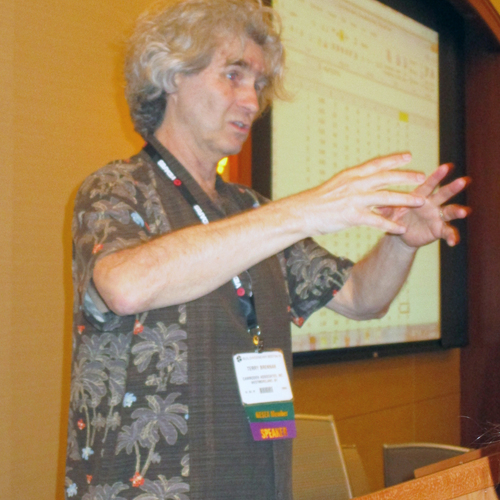 Balanced ventilation offers the location control advantages of both exhaust and supply ventilation. Additionally, balanced ventilation provides an opportunity to include a heat exchanger between the outgoing air and the incoming air to precondition the incoming air. A balanced ventilation system with such a heat exchanger is called a heat-recovery ventilator (HRV). Forced ventilation has some costs. 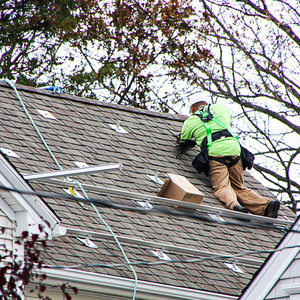 The most obvious cost is the initial cost of installing the necessary fans and ducting. Also, there are operating costs associated with running the fans. Finally, there is cost associated with conditioning the additional incoming air so that it has the desired temperature and humidity. The remainder of this analysis focuses on the incremental heating energy aspect of forced ventilation. Suppose that we have determined that we need 100 cfm of air exchange in order to provide adequate ventilation. Let’s look at the performance of each type of forced ventilation system during a time in which the indoor and outdoor temperature are equal and the wind is not blowing. In other words, we will assume the natural ventilation forces are not present. Although the house has holes, under these conditions no air would flow into or out of those holes absent some forced ventilation system. The fan of an exhaust ventilation system will blow 100 cfm of air from the inside to the outside. 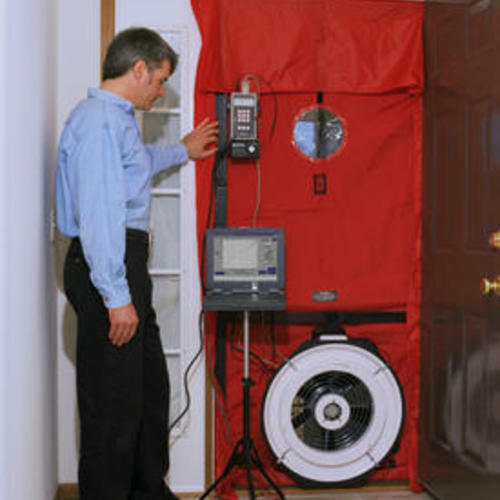 As a result, the average air pressure in the house will drop by enough that 100 cfm of air is drawn in through holes. (See Image #1, above.) Thus, it’s necessary to condition 100 cfm of air that would not need to be conditioned with no forced ventilation. Similarly, a supply ventilation system will draw 100 cfm of air into the house, increasing the air pressure inside by enough to force 100 cfm of air to flow out through the holes. Like the exhaust system, there is 100 cfm of additional air to condition. Finally, one fan of a balanced ventilation system will draw in 100 cfm while the other pushes out 100 cfm. Again, there is 100 cfm of additional air to condition (although it may be preconditioned by the core of an HRV). In this operating condition, the three systems each increase air exchange by the same amount. Now let’s look at a circumstance in which the natural ventilation forces are strong due to either a temperature difference, wind, or a combination of the two. Suppose that, based on the size of holes in this house, 200 cfm would flow into some of the holes and 200 cfm would flow out of other holes with no forced ventilation in this condition. Since we decided that only 100 cfm of exchange is required, it would be best not to add more, disregarding the location advantages. 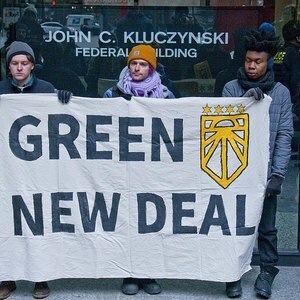 Theoretically, we could actively control any of the ventilation systems to shut off in this condition, but that would require continuously measuring the natural ventilation rate, which is difficult. Exhaust ventilation forces 100 cfm of air out of the house, lowering the indoor air pressure with respect to the outdoors. In response to this change in air pressure, the inward flow through the holes increases and the outward flow decreases. Instead of 200 cfm in each direction, 250 cfm flows in through the holes and 150 cfm flows out through the holes. (See Image #2, below.) The incremental air to be conditioned is only 50 cfm. Supply ventilation behaves similarly. Forcing 100 cfm into the house increases the indoor pressure enough to increase the outflow rate to 250 cfm and to decrease the inflow rate through the holes to 150 cfm. The total inflow rate (100 cfm forced plus 150 cfm through the holes) increases by only 50 cfm. The balanced system does not impact the rate of flow through the holes, so the incremental amount of air that needs to be conditioned is still 100 cfm. The reduction in the amount of incremental air that needs to be conditioned may be very important during these periods because they tend to correspond to time periods with the highest temperature differences. The graph reproduced as Image #3 (below) indicates the relationship between the natural ventilation rate and the amount of incremental air that needs to be conditioned. (The line for exhaust is hidden under the line for supply because the lines are identical.) Both exhaust and supply have a beneficial passive correction effect by which the amount of incremental air decreases to half as much when natural ventilation is high. The line for CFIS represents as system that provides the same average ventilation rate by operating 20 minutes of each hour at a flow rate of 300 cfm. This system also passively adjust to increased natural ventilation rate although it adjusts more slowly. Not only does indoor pollution vary from room to room, it also varies over time. For example, although the air quality may usually be pretty good in the kitchen, it is not so good after baking that salmon loaf. For this reason, houses have various spot ventilation systems such as range hood fans and bathroom fans. Appliances such as gas laundry dryers, some gas water heaters, and central vacuum systems also have fans to blow polluted air to the outside. Since the point of spot ventilation is to remove localized polluted air, exhaust ventilation is used. Although removing indoor air may be the motivation for using spot ventilation, spot ventilation also has the effect of increasing the flow of outdoor air into the house by decreasing the indoor air pressure. 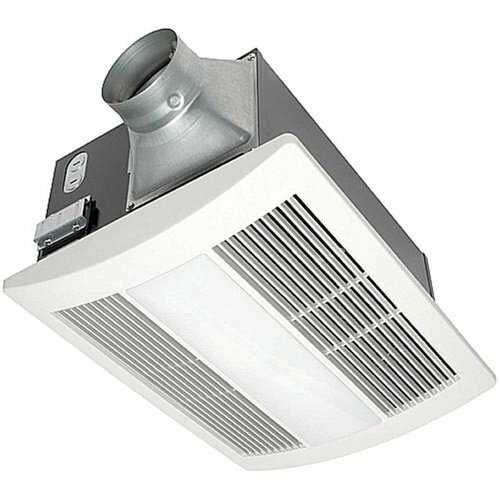 Therefore, while a spot ventilation fan is running, it may satisfy the air exchange requirement, making additional forced ventilation temporarily unnecessary. When the exhaust ventilation system also operates at 100 cfm, a total of 350 cfm of air flows in through the holes. The incremental amount of air that must be conditioned increases by 100 cfm relative to no forced ventilation system. When a 100 cfm supply ventilation operates at the same time as the 250 cfm spot ventilation, 100 cfm of air flows in through the ventilation system and the inward flow of air through the holes decreases to 150 cfm. The total amount of air that needs to be conditioned is 250 cfm – the same as without any forced ventilation system. The supply ventilation system does not increase the inward flow, it merely draws some of that air from a more opportune place. In this condition, the supply system outperforms the HRV which allows 250 cfm of unconditioned air to come in plus 100 cfm of partially conditioned air. 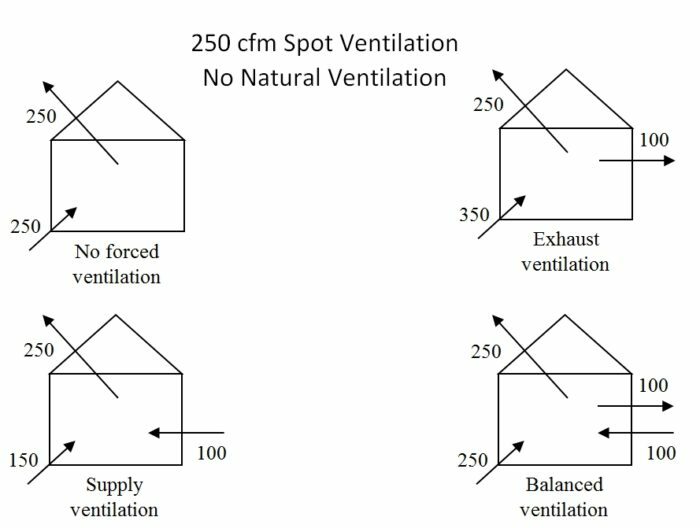 The graph in Image #5 (below) shows the effect of each type of ventilation system when 250 cfm of spot exhaust ventilation is also operating. For exhaust ventilation, the passive reduction is delayed until much higher natural ventilation rates. For low natural ventilation rates, the supply ventilation system passively eliminates any additional ventilation, thus reducing the energy required to condition incoming air. 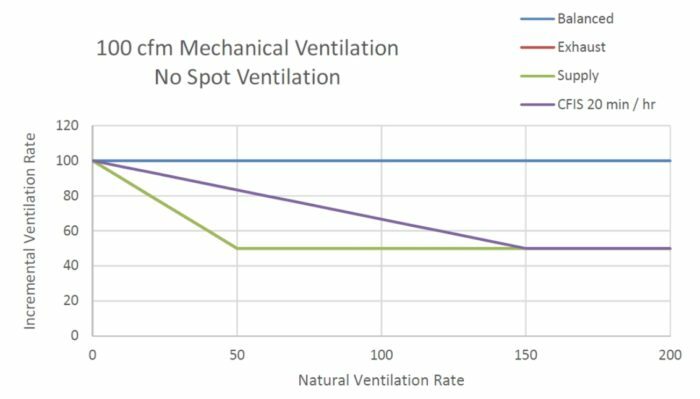 Since the performance of forced ventilation systems interacts with natural ventilation and spot ventilation, these interactions needed to be considered when modeling performance. An HRV will not always have less impact on heating and cooling loads than an exhaust ventilation system or a supply ventilation system. During periods of high natural ventilation, the heating load impact of supply or exhaust type systems passively drops 50%, so an HRV would need to be at least 50% efficient to break even. When spot ventilation is operating, supply ventilation provides the benefit of bringing in air from a more suitable location without increasing the heating or cooling load.